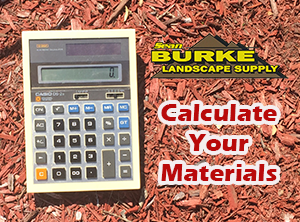 Topsoil, Sand, Stone, Mulch Calculator Your dependable, fast and reasonably tool from Burke Landscape Supply. Just fill in your measurements in our material calculator then enter your info to get a price on your mulch, topsoil & stone. Rock mulch is sometimes used in perennial flower beds or other perennial plantings. Large rocks absorb even more heat from the sun during the day, creating the potential for larger warm micro-climate areas than small pebbles. It all depends on the size, quantity, and color. Dark stones and rocks will absorb more heat than white or light-colored stones. Larger stones and rocks also cover more area with fewer stones, so if the rock mulch needs to be completely removed, it’s an easier process than with pebble mulch/gravel. A pretty good covering of larger stones will also help prevent soil erosion to some extent. Newspapers in the garden are a bit unsightly, though, so I would recommend laying another type of mulch, perhaps compost or wood chips, on top of them. Besides, that’s added organic matter, and that is definitely a good thing. One interesting thing that I’ve observed has to do with worms. Every time I’ve cultivated the ground, when I shift about the layers of partly decomposed paper stuff, there always seems to be huge gatherings of worms under and around them. I don’t know the reason for it, but I’ve come up with a few theories: If you do not want to wait, then get your numbers and call 610-494-9490 with your needs and get a quote over the phone during business hours. What ever works best for you, Burke can accommodate. Use our handy mulch calculator to get an accurate Quote on your landscaping materials. Your Quote for Topsoil, Sand, Stone, Mulch will be emailed to you. If you are in a hurry, call for your material quote for Topsoil, Sand, Stone, Mulch. *Prices Listed on our Materials Pages are for Customer Pickup. Delivery Charge & Sales Tax are not included and are Extra. All Major Credit Cards Accepted. Presently we only have a materials calculator for Landscaping material such as mulch, topsoil & stone. Spring Materials quotes can be given by phone only at 610-494-9490. We Deliver to a 20 mile radius from our yard in Trainer, PA 19061. Call or use our Quote form to request your landscape material delivery.